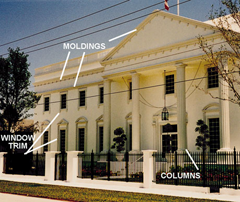 Foam Factory Inc. offers Classical Corinthian, Ionic and Doric column capitals in many sizes to fit round or square columns. Foam Factory Inc.is a family owned business started in 1976. The company has several divisions, the largest servicing the construction industry with columns, moldings, arches, brackets, medallions, balustrades, quatrefoils and many other architectural trim products. Foam Factory supplies architectural trim to both residential and commercial builders and offers products for both the interior and exterior of homes and buildings. Our lightweight building products allow more freedom for custom design, create more dramatic interiors and exteriors and lower the costs of construction substantially. We utilize a unique polystyrene substrate as the architectural core. The polystyrene is shaped using a high speed, computerized shaping system that allows for limitless design capabilities.